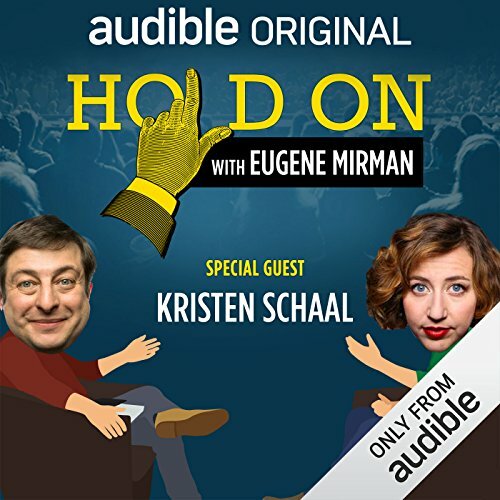 [Contains explicit content] Cartoon siblings reunite on this episode of Hold On as Kristen Schaal (Bob's Burgers, The Last Man on Earth) joins Eugene Mirman in the studio to tell a story of a Sideways-themed winery tour. It's all vintages and pairing recommendations until things take a hard turn. Hear her story and the questions it raises for our curious host, who refuses to put a cork in it and leave a story unexamined. In each episode of the Audible Comedy series Hold On, host Eugene Mirman (Bob's Burgers, The Flight of the Conchords) pauses the funny stories of comedians and performers to get the skinny behind the story. 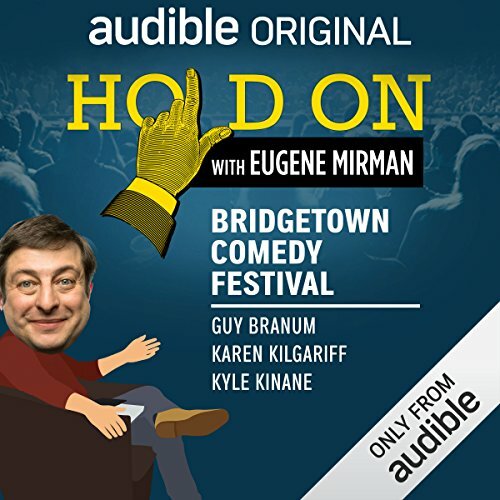 Featured and future guests include: Jim Gaffigan, "Weird Al" Yankovic, Lisa Lampanelli, Mike Birbiglia, Reggie Watts, Kumail Nanjiani, Maria Bamford, Hasan Minhaj, David Cross, and more! Enjoy new episodes on Audible Channels. ©2017 Audible Comedy (P)2017 Audible, Inc.
[Contains explicit content] Jonah Ray (Mystery Science Theater 3000, The Meltdown with Jonah and Kumail) is the exact sort of guy you would expect to find working in a record store. You might also expect that 9/11/2001 was not a great day to have to go to work, but what you might not expect is that Jonah's workday had its own unpleasant surprises. Tragedy plus time equals comedy and host Eugene Mirman brought Jonah into the studio to go over his experiences on that infamous day. [Contains explicit content] Sasheer Zamata (Saturday Night Live, Sasheer Zamata Party Time) went to a Christian elementary school where discipline-by-paddle was a looming threat for ill-behaved students. Reflecting upon the inconsistencies of parochial punishment from an adult's perspective, Sasheer found a lot to question about how and why paddlings were meted out, as you can hear in the story she told for RISK! [Contains explicit content] Nick Thune doesn't go looking for fights, but fights seem to find him anyway. When they do, though, it's his inability to let some things slide that causes his momentary anger to boil over into small acts of passive-aggression: snarky rejoinders, anonymous notes, and the occasional sarcastic email. Find out which option Nick chose when confronted with an unprofessional doctor in his story live at SF Sketchfest for Porchlight, A Storytelling Series. [Contains explicit content] Mark Normand doesn't have a filter: in his stand-up he isn't afraid to dip into darker topics and shock laughter out of audiences. When Eugene Mirman brought Mark into the studio to tell a story, it came as no surprise that things went to several dark places: a bad break-up in a tiny apartment, the bottom of a bottle or two, and a homeless shelter. [Contains explicit content] Julie Klausner (Difficult People, author of I Don't Care About Your Band) is a sharp-tongued comedian whose ability to dress down celebrities is well documented. When caught off guard by a rude stranger when she was visiting Italy, Julie responded in a less articulate but no less effective manner. Eugene Mirman brought her into the studio to share the ordeal and have a few laughs about it. Eugene Mirman ventures once more into the Great White North to hold court over another night of storytelling at the Just For Laughs Comedy Festival. Jon Glaser (Parks and Recreation, Girls, Delocated) is a pretty cool guy, but even cool guys make mistakes. On this airborne episode of Hold On, Jon revisits the time he mistook a fellow passenger in first class for someone else and the awkward flight that ensued. Host Eugene Mirman is on board for the awkwardness, to ask some questions, and land a few jokes. 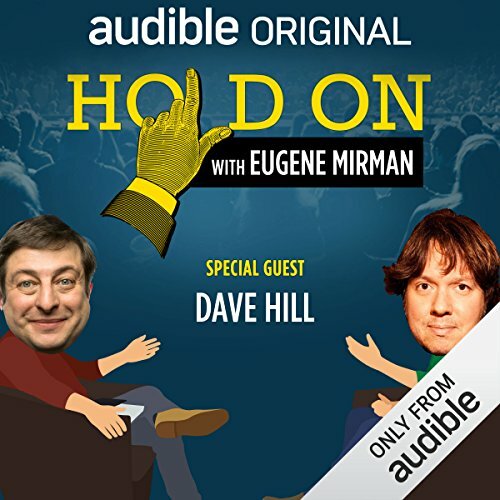 Dave Hill (author of Tasteful Nudes and Dave Hill Doesn't Live Here Anymore, host of The Goddamn Dave Hill Show on WFMU) could probably shred a little death metal if you asked him, but that doesn't make him an expert on death. Dana Gould (Stan Against Evil, The Simpsons) is a comedian of note, sometimes credited as the progenitor of alternative comedy, but anyone who has heard his act or his podcast, knows that he's big into horror and sci-fi movies. Matt Bellassai (author of Everything Is Awful, Buzzfeed's Whine About It) is an internet wunderkind now bursting into old media with his book. Kelly Oxford (author of Everything is Perfect When You're a Liar and When You Find Out the World Is Against You) is a Canadian expat who now lives and works in LA, but the first time she visited the City of Angels was on a very specific quest. Horatio Sanz is an important figure in the Chicago comedy scene. The Chicago neighborhood that teenage Horatio would frequent with his friends also happened to be home to a few unsavory characters, one of whom may have improvised a little vigilante justice and a lot of arson.